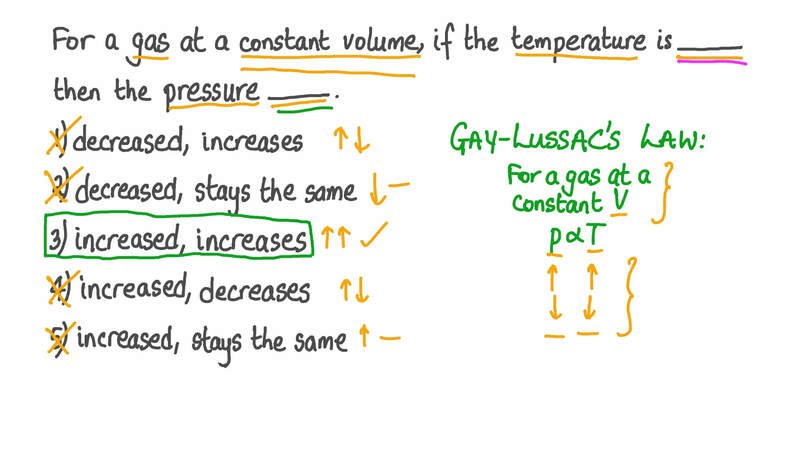 In this lesson, we will learn how to use the formula P/T = constant (Gay–Lussac's Law) to calculate the pressure or temperature of a gas that is heated or cooled at a constant volume. For a gas at a constant volume, if the temperature is then the pressure . 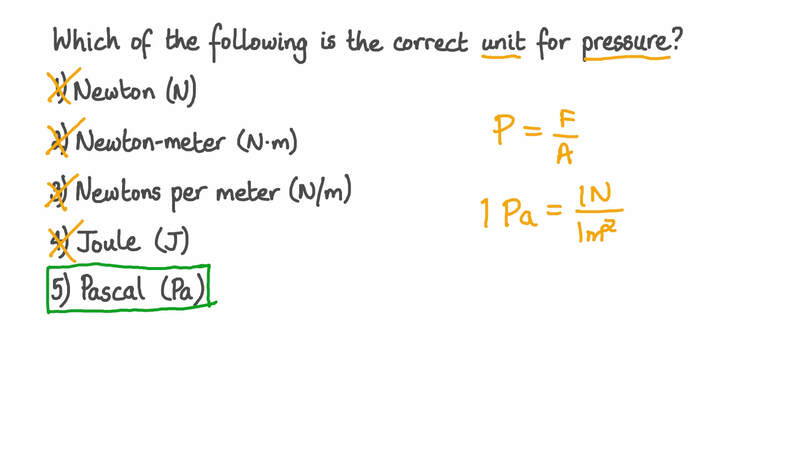 Which of the following is the correct unit for pressure? A gas has an initial pressure of 500 Pa, a volume of 0.1 m3, and a temperature of 300 K. It is allowed to expand without changing temperature until its volume is 1 m3. Then, the temperature of the gas is increased, while the volume is kept constant, to 360 K. What is the final pressure of the gas? A gas has a volume of 5 m3. If it is heated, where the volume is kept constant, such that the pressure increases by a factor of 4, by what factor does the temperature change? Which of the following is the correct formula relating the pressure and temperature of a gas that is kept at a constant volume? 𝑇 represents the temperature of the gas, 𝑝 represents the pressure of the gas, and 𝑉 represents the volume of the gas. 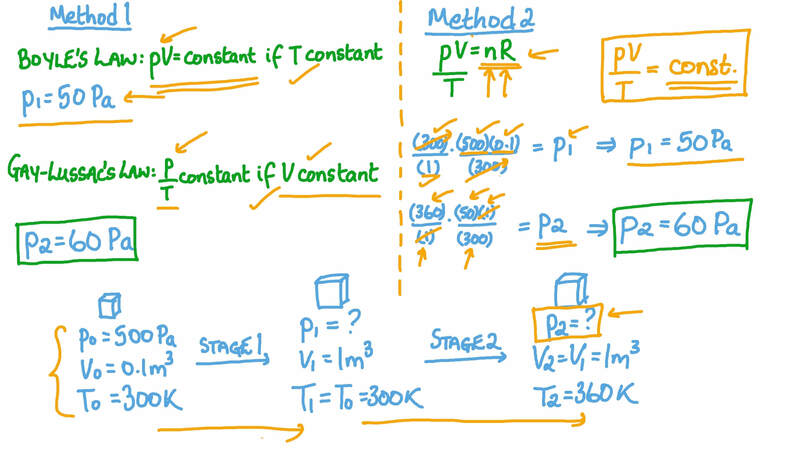 A gas with a volume of 2 m3 is initially at a temperature of 300 K and a pressure of 500 Pa. It is heated to 375 K while being kept at a constant volume. What is the pressure of the gas after it has been heated? A sealed container contains 0.4 m3 of helium gas at a temperature of 400 K and a pressure of 50 kPa. The temperature of the gas is halved while the volume is kept constant. Then, the volume is reduced to a quarter of its original value while the temperature is kept constant. What is the final pressure of the helium? For a gas of a fixed volume and mass, the pressure when divided by its temperature, 𝑝 𝑇 , is 0.16 kPa/K. To what temperature must the gas be heated in order to produce a pressure of 40 kPa? A gas is heated from 1 9 ∘ C to 8 0 ∘ C , while the volume is kept constant. If its initial pressure was 2 0 0 0 Pa, what is the pressure of the gas after having been heated? Give your answer to 3 significant figures. The graph shows the pressure and temperature of a gas as it undergoes two processes. The gas initially has a temperature of 100 K and a pressure of 35 kPa. Line 𝐴 on the graph shows the gas being heated to 500 K at a constant volume. Line 𝐵 on the graph shows the gas changing in volume while the temperature remains constant at 500 K.
By what factor does the volume of the gas increase after undergoing these two processes? The graph shows how the pressure of a gas in a container of a fixed volume changes with the temperature of the gas. What is the pressure of the gas at 200 K? What is the pressure of the gas at 400 K? If the gas was heated to 800 K, what would the pressure of the gas be? 10 m3 of helium gas is allowed to cool from a temperature of 400 K to a temperature of 290 K. The helium is kept at a constant volume. If the final pressure of the gas is 1 2 0 0 Pa, what was its pressure before cooling? Give your answer to 3 significant figures. A gas with a volume of 0.5 m3 is initially at a temperature of 240 K and a pressure of 800 Pa. The gas is heated while being kept at a constant volume until its pressure is 1 0 0 0 Pa. What is the temperature of the gas after it has been heated?